have a deep rustic grain patterned from real split cedar. WHY CHOOSE ALL AMERICAN WINDOW & DOOR? Because we offer many siding options to choose from when deciding upon an exterior wall covering for your home. Choose from Cedar Shake, Hand-Split Shake and Half Rounds to create a unique look. Use these distinctive textures to accent gables and provide a dramatic contrast to stone or clapboard. Hand-Split Shakes are rich and rustic, and their deeply-ingrained textures provide contrast and visual interest. Hand-split shake has the look and feel of real split cedar. 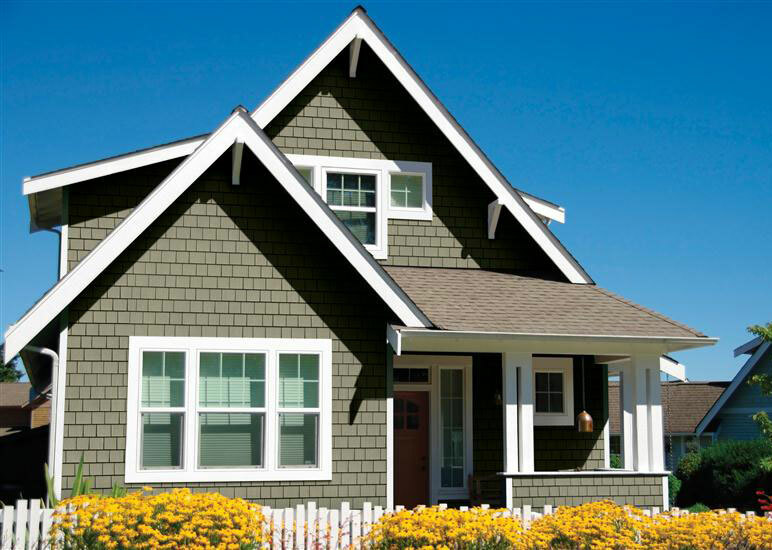 Cedar Shake is the classic shingle style. Combined with stone or clapboard, it creates a striking and inviting exterior design. Great for accenting gables and dormers! Half Rounds are a scalloped version of straight-line shakes, perfect for everything from a grand Victorian to the simplest cottage. Half Rounds provide a unique style that is beautiful and maintenance-free year round! 8″ long Cedar Shakes have a deep, shadowed profile highlighting a distinctive texture that covers the face of the panel. 8″ long Cedar Shakes combine perfectly with CraneBoard® and BellaStone™ to add beauty and exceptional performance to your design. No matter what style you choose, each of the Portsmouth Shakes™ have a deep, rustic grain patterned from real split cedar. No painting. No scraping. True maintenance freedom! Reinforced nail slots and perimeter locks .100” thick and resist winds up to 160 MPH. Portsmouth Shakes™ are available in 10-14 colors, depending on the profile.